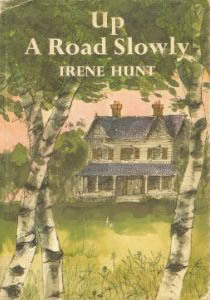 If you are looking for a plot-driven book, Up A Road Slowly by Irene Hunt is not the book for you. This quiet novel is about Julie’s growth, her changing relationship with her relations, and her adolescent romances. This is a lot of story to pack into a book of less than two hundred pages! For this reason, I once thought the book tedious but now love most everything about it. I’m glad that it survived the cull of my books when I moved out on my own as an adult. The first chapter doesn’t sell me on the book. The transitions between scenes aren’t always clear, leaving me sometimes confused about what has transpired. The adult tone also feels awkward, uneasily moving between a child’s perspective and an adult’s memories. Moreover, I spend too much time wondering about Julie’s age, where her family lives, and even where the story of her life happens. The latter may not really be the fault of Irene Hunt. The life she described may be accurate to 1966, the year the book was published. If it’s autobiographical, it could depict the decades the years in which Irene Hunt grew up. My confusion rather may suggest that parts of the book have dated. Normally too, I dislike “coming-of-age” novels. They often amount to little more than summaries of a character’s life at certain ages. My husband who read Up A Road Slowly as part of our family’s book discussion too even commented on how the book started out like a summary. Relying on memory of earlier reads, I said I had kept the book because the main character wanted to become a writer. This revelation doesn’t actually occur until the end. One can see the signs throughout however: Julia loves words, to read, memorize, and write poetry, to read hefty adult classics, and to dabble in writing stories. Up A Road Slowly ultimately succeeds largely for the same reason that Anne of Green Gables does. The authors of both “coming-of-age” books pick only pivotal scenes to detail. Therein, we learn to love the main characters and enjoy reading about their journey to maturity. Interestingly, there are other similarities between the books: In Up A Road Slowly, Julie moves in with Aunt Cordelia and Uncle Haskell–a sister and brother who live together but have never married. In Anne of Green Gables, Anne moves in with Marilla and Matthew–another sister and brother set who have never married. Marilla is old-fashioned and stifling to Anne; so is Aunt Cordelia. Both adult women had a beau whose departure they regret. Although Julie’s Uncle Haskell is nowhere near the saint that Anne’s Matthew is, both men offer lifelong advice and encouragement. Ultimately, Up a Road Slowly is about much more than Julia’s literary aspirations, which is why now I love most everything about it. This read around, my favorites were those that resonated with my own experiences. For example, Julia grew up with a close bond to her sister Laura but struggled with losing that position when Laura married. Similarly, my younger sister and I struggled to remain close after I moved nearer to my boyfriend. Julia grew up with her aunt and struggled as an adult about how long to continue living at home. Similarly, because my dad widowed early in my early life, I grew up with a tight connection and didn’t really feel free to leave until he remarried. My dad picked this book largely because he felt my sister and I would relate to Julia’s writing experiences. What does Up A Road Slowly offer to those with different interests? Most every chapter chronicles an event that helped Julia mature. The scenes are heartfelt, such as the ones about a classmate whom Julia despised because she talked, acted, and smelled funny. They are also replete with ideas about how the choices we make effect the people we become. Up A Road Slowly is an absorbing and beautiful book. 6 Responses to "Up A Road Slowly by Irene Hunt"
I approved this pingback, because it’s from another reviewer of Up A Road Slowly. Up a road slowly is a very good book. There were sad parts and happy parts and it only took me one day to read! Like Allison, I love Up a Road Slowly. In fact, unlike Allison, I even like its first chapter, which casually introduces most of the main characters and describes the most important setting (Aunt Cordelia’s house) while initiating the plot. And, even though I agree with Allison that it is not the book for someone looking for a plot-driven book, I enjoyed its story and was happy when Julie and Danny finally realized that they loved each other. However what I like most about the book is the feature that Allison emphasizes, Julie’s growth “from a tantrum-throwing 7-year-old to a gracious young woman of 17” (quoting The New York Times Book Review on the book’s dust jacket). Finally, for Allison, I really like your comparison of the book with another of my favourite “coming-of-age” books, Anne of Green Gables. Incidentally, my siblings and I also found the first chapter of Anne of Green Gables slow. 🙂 In contrast, they liked ALL of Up A Road Slowly. I consider their opinion a stronger commendation for Up A Road Slowly than mine, because they are closer to the age of book’s intended audience. Other readers of Up A Road Slowly, what do you think of its first chapter and the rest of the book?